brommel: Don't follow every sign! 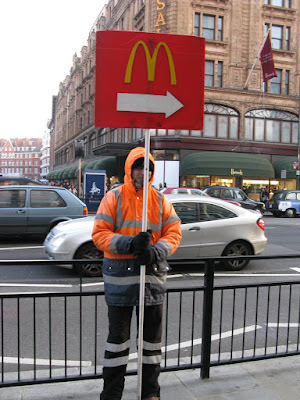 One of the 2009 New Year's resolutions: Don't follow every sign. Photo from London, December 2008. My daughter says every time we passed by a McDonald´s: "Daddy, there is where people get fat and older, right?" Alejandro: What your 4 year old daughter is saying should be printed on the wrapping material for fast food burgers in the same way it is done in the smoking business.